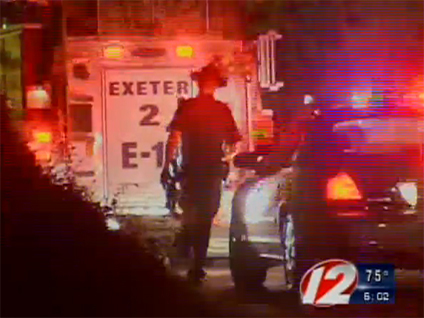 EXETER, R.I. - Two teenage girls died in a car crash after a nighttime visit to a cemetery to visit the grave of a purported vampire. Police told CBS Affiliate WPRI Bella DiPalma, 17, and Elenna Zuller, 16, both of Warwick, R.I., died when their car lost control on Purgatory Road and flipped over late Wednesday night. Capt. Darren Delaney said one of the girls was pronounced dead at the scene; the other later died at Rhode Island Hospital. Police say neither girl was wearing a seatbelt. Two other passengers in the car were wearing seat belts and escaped with minor injuries, reports WPRI correspondent Walt Buteau. "It's unfortunate but the bottom line is, the two people that were fatalities didn't have their seat belts on," Delaney told WPRI. Delaney said there was no sign that alcohol was involved, but added speed could have been a factor. The speed limit where the crash happened is 25 miles-per-hour. Delaney told the Associated Press the girls decided to drive down the "dark, windy road" because they thought it looked "haunted." The car swerved and rolled over. Police said the teens were returning from visiting the legendary grave of purported vampire Mercy Brown. In 1892 the body of 19-year-old Mercy Lena Brown was exhumed at Chestnut Hill Cemetery and mutilated by townspeople who believed she suffered from vampirism. A candlelight vigil is planned for Saturday on the soccer field at Pilgrim High School where both victims attended. Click on the video player below to watch coverage from CBS Affiliate WPRI.